The Minister of Defence Manohar Parrikar made an official visit to the United States at the invitation of US Secretary of Defense Ashton Carter from December 7 to 10, 2015, that included visits to multiple US facilities— the US Pacific Command (PACOM), the Pentagon, and a visit with Secretary Carter to observe flight operations aboard the aircraft carrier USS Dwight D. Eisenhower (CVN-69). First, Parrikar participated as a guest of honour in a Pearl Harbour commemorative ceremony at PACOM. He also met with Admiral Harry Harris, the PACOM Commander, and visited various facilities in Honolulu, Hawaii. 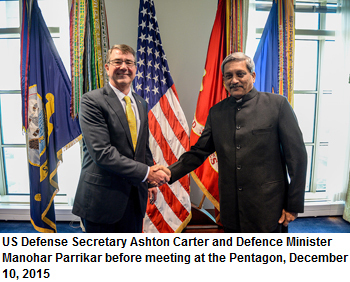 At the Pentagon, Parrikar and Carter held their third meeting. They discussed the India-US defence relationship and broader India-US strategic partnership, and focused on ways to maintain the strong momentum of security and defence engagement, including means to further move the Defence Technology and Trade Initiative (DTTI) forward. The two expressed satisfaction with DTTI progress to date. They committed to identifying additional projects for possible co-development and co-production of high technology items that meet the transformational intent of DTTI. They commended positive discussions at the Joint Working Group on Aircraft Carrier Technology Cooperation (JWGACTC), especially in the area of Aircraft Launch and Recovery Equipment (ALRE), and look forward to continued progress to be achieved at the second meeting of the JWGACTC in February 2016 in India. They further expressed satisfaction that the Jet Engine Technology Joint Working Group (JETJWG), which met in Bengaluru, had concluded its terms of reference and had productive discussion on cooperation in this area. Secretary Carter informed Parrikar that in light of the strengthening relationship between the United States and India, the Department of Defense (DOD) has updated its policy on gas turbine engine technology transfer to India. As a result of this policy update, the Secretary is confident that the United States will be able to expand cooperation in production and design of jet engine components. The two now look forward to US companies working with their Indian counterparts to submit transfer requests that will benefit from this updated policy. Minister Parrikar informed Secretary Carter about the ‘Make in India’ initiative, under which several reforms have been taken in the Indian defence sector. Secretary Carter welcomed Indian initiatives in this regard and hoped that this would pave the way for even greater participation of US companies in the defence sector. The Secretary welcomed India’s participation in the Rim of the Pacific (RIMPAC) multilateral naval exercise in 2016 as well as participation by the Indian Air Force in the multilateral Red Flag exercise in April-May 2016, and expressed support for greater air-to-air interaction in the future. Minister Parrikar welcomed announcement of US participation in the International Fleet Review of the Indian Navy at Visakhapatnam in February 2016. The two leaders expressed satisfaction at the level of maritime cooperation between the two navies and resolved to further expand the same in coming years. They announced their intention to soon complete a memorandum of understanding between their navies on ‘white shipping’ information sharing. They also welcomed the renewal of the Fuel Exchange Agreement. They commended the progress achieved in November at the Defence Policy Group (DPG), including the re-establishment of a working group on humanitarian assistance and disaster relief (HADR) cooperation under the Military Cooperation Group and focused discussions on defence capability development. They also discussed a wide range of regional security issues, including the threat posed by ISIL and entities such as Al Qaeda and its affiliates, Lashkar-e-Taiba, Jaish-e-Mohammad, D Company, the Haqqani Network, and other regional terror groups. 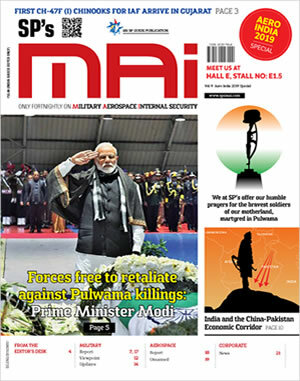 They discussed ways to implement the defence-related aspects of Prime Minister Modi and President Obama’s Joint Strategic Vision for the Asia-Pacific and the Indian Ocean region. The official visit underlined the strategic importance of the defence relationship and the personal priority that the Minister and Secretary place on the bilateral partnership. During his visit, Minister Parrikar also met with senior National Security Council officials and members of Congress.